Maharaji Kripalu has proven himself the master at reconciling the philosophies of the acharyas who came before him, and simplifying the path of the devotee. In the day of Brahma, which is 4,320 million years, the supreme descent of Radha Krishn happened at least once, when they revealed the absolute bliss of braj ras, nikunj ras and maharas through their leelas. This was only 5,000 years ago, before the beginning of kaliyug. About 500 years ago Shree Radha Rani herself appeared as Shree Chaitanya Mahaprabhu to deliver this same bliss. And now our supreme acharya, Bhakti-yog-rasavatar, Jagadguru Shree Kripaluji Maharaj -- Maharaji Kripalu -- is delivering the same bliss of Radha Krishn love. 1. He has reconciled the philosophical differences that appeared in the Darshan shastras and the bhashyas of the previous Jagadgurus. Our scriptures and all the writings of our acharyas and Jagadgurus are in Sanskrit, and not commonly understandable. And even if one knows Sanskrit, the related themes of these writings appear to be contradictory. Our Maharajji reconciled the philosophical, devotional and general contradictions of the Vedas, Puranas, Darshan Shastras and the bhashyas of all the Jagadgurus. 2. He has revealed the true path to God, adoptable by everyone. There is a great confusion in the world regarding the true path to God. Even during the time of Jagadguru Shankaracharya (about 2,500 years ago) there were hundreds of paths to God. Now there are a number of religions and thousands of self-proclaimed paths. 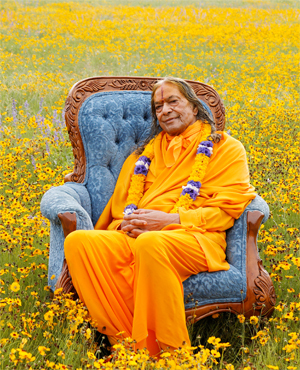 Maharaji Kripalu has dispelled this cloud of confusion, showing the true and practical form of selfless devotion to God that could be practiced by everyone in the world. He has also revealed the fact that Radha Krishn are the sweetest and the most loving form of God. 3. He has produced an enormous amount of devotional material -- thousands of discourses -- in an easy to understand style for the devotees, in his books “Prem Ras Siddhant,” “Radha Govind Geet,” and “Bhakti Shatak.” In addition, he has revealed over 1000 songs (called pad) of leelas, concerning philosophy and humbleness, that cover every aspect of devotion, produced over five hundred chants of the name, form, virtues and leelas of Radha Krishn. He has established two unique divine monuments: “Bhakti Mandir” in Mangarh (near Allahabad) and “Prem Mandir” in Vrindaban, to enlighten the true aspirants of God’s love for thousands of years, glorifying the greatness of Vrindaban. This is a unique event in the last 5,000 years, our beloved Bhakti-yog-rasavatar, Maharaji Kripalu, whose graciousness has no limit, and whose compassion is unequalled. That is why he is being honored as the supreme Jagadguru and the supreme acharya of this age, and his teachings a wonderful glimpse of the divine.